Russ 3D Hybrids | A blog to document my 3D Hybrids research. Thanks to Tom for this one. trueSpace 7.5 has just been released. By the way the news article describes it, it sounds like a product definitely worth looking into. Its a fully functional 3D package capable of all the usual stuff, modelling, animation, posing, materials and mapping and is even compatible with Vray for rendering. But the most interesting this about this software is that the interactive 3D environment is really advanced. Apparently it’s capable of soft shadows, transparencies, reflections and mirrors, sophisticated materials, handling of HDRI backgrounds, and more. Not only that but the environment is multi-user over the internet like an online multiplayer game!! Also if you don’t own trueSpace, you can download the free truePlay application and view trueSpace environments. This opens up amazing collaborative opportunities. I would really like to give it a go. They also offer an online socialising network called truePlace that seems to run on the same engine. This was created for use with 3D Studio max. It’s a plugin that enables you to take multiple renders of your model or scene from lots of different angles and then compile them into a flash programme. Click on the image above for an example. It’s a neat little programme, although not very smooth. I guessing it’s possible to take more shots to make it smoother, but at the same time a longer download. You need the .NET Framework installed to run the compiler. 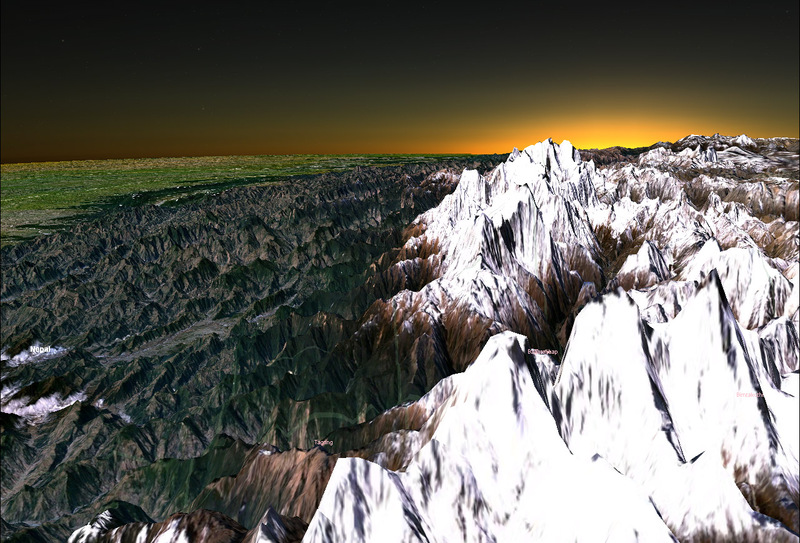 Ever seen the sun set over the Himalayas? 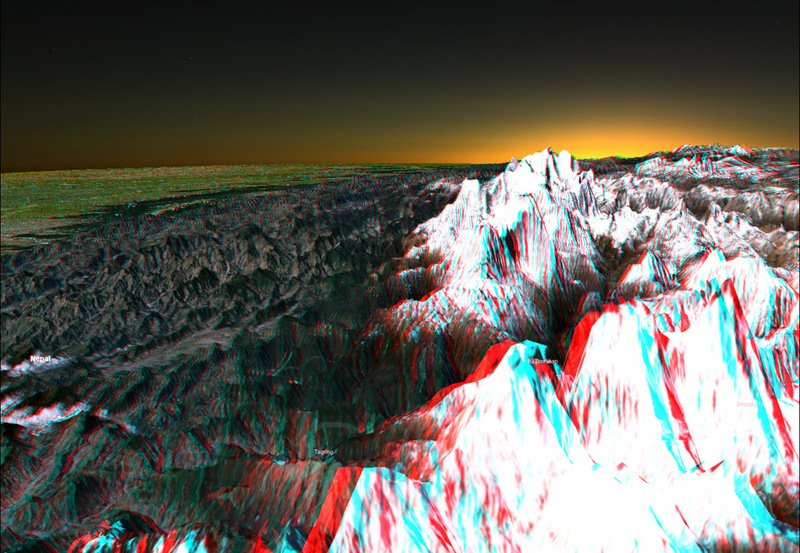 NASA’s answer to Google earth has fantastically detailed displacement maps of Earths terrain. There are loads of different views and options for viewing the planet, plus you are not confined to our own planet, the other current available destinations are, the Moon, Jupiter, Mars, Venus and a very detailed section of the stars viewed from Earth. There are other options such as sunlight and atmospheric scattering, which you can see in the above screen shot. However unlike Google Earth, World Wind doesn’t have very detailed images of cities, so zooming in really far will not produce very interesting results. It’s still really fun to play with though, I think controlling the camera navigation in World Wind works a lot better than the one in Google Earth. If only they combined powers! Also at the moment you have a single planet view and when you change planet everything goes blank and re-loads. It would be so much more fun if you actually navigated to the next planet as if you were flying around the solar system. I suspect that it is like this currently because when you navigate the planet you are actually dragging the planet around a static camera rather than the other way around. I think the navigation should be more like a first person shooter, it would take a bit longer for a non-gamer to learn but it would be so much better! I have ‘built’ a home made interactive, tilt / pressure sensitive screen. All I used was my normal Wacom tablet (Intuos 3) and the mini projector borrowed from uni. It is extremely simple and crude. I strapped the projector to my tripod with cello-tape and mounted it above my Wacom tablet which was on the floor. I used a dumb bell to counter the weight of the projector on the tripod. Wacom have their own screen tablet with their Cintiq range, however these are very expensive. This is in essence a cheap version of that product without any dissecting of valuable equipment. Although this is a fairly interesting solution, there is a slight lag between the tablet and the screen. The biggest draw back though is that because the surface of the tablet is so smooth to avoid damage to the pen, you get quite severe glare from the projector above, a problem which would not be an issue in Wacom’s own Cintiq tablet. The end of the video shows a short clip of my anaglyph animation running on the wacom screen. A possible idea for my final project would be some sort of an interactive anaglyph programme running on this set up. I have found a similar project to this. Some nutta has built a Wacom tablet screen by taking apart a tablet and a LCD screen and combining them together. This would probably work much better than my version, however taking apart all that equipment can be risky and expensive, my way avoids any of that risk.